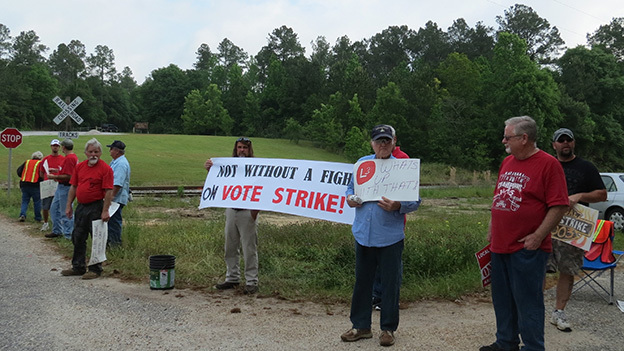 IAM Local 2003 members in Daleville, AL strike against Army Fleet Support (AFS) at Fort Rucker after voting to reject a “last, best and final” offer from parent company L3 Communications. Nearly 3,000 members of IAM Local 2003 in Daleville, AL are on strike against Army Fleet Support (AFS) at Fort Rucker after voting to reject a “last, best and final” offer from parent company L3 Communications. IAM members at AFS provide helicopter maintenance, service and training at Fort Rucker under a $2 billion contract from the U.S. Army that runs from 2012 through September 2017. Key issues in the dispute include duration of the proposed accord, inadequate training and increased workloads, in addition to language changes regarding seniority, overtime procedures and transfers. Area residents, supporters and spouses took to Facebook and social media outlets where they echoed the concerns of IAM strikers at AFS.